Wasn’t everything just so much better in the old days? Who needs a new Star Wars movie anyway? If you’re feeling nostalgic for the look and feel of the classic Windows Start menu, there’s a way to bring it back — provided you’re willing to shell out a few quid for a third-party plugin. The program in question is Stardock Start10, and it’s free for 30 days. After that, it’ll cost you $4.99 (£3.52). There’s no complicated setup or even a reboot to sit through — as soon as you’ve got the application installed on your Windows 10 computer, open up the Start menu for a hit of Windows 7-inspired nostalgia. 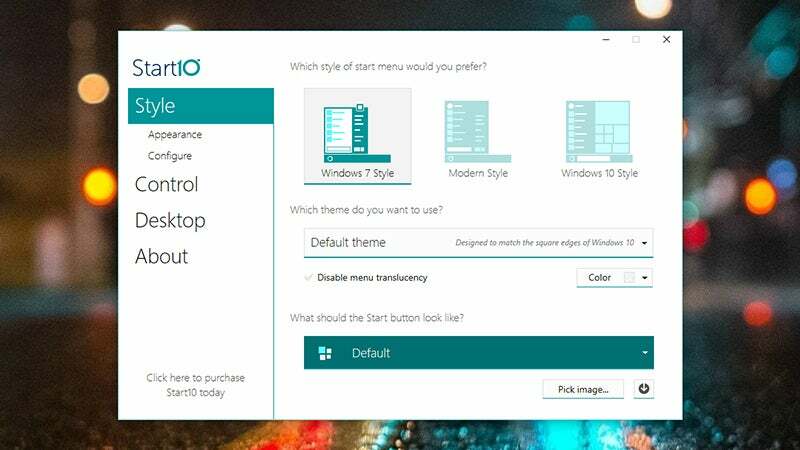 Start10 comes with a commendable number of options for you to play around with: there are actually three different looks to choose from (classic Windows, new Windows, and a fusion of both), and you can tweak icon sizes and colors as well as the appearance of the Start menu as a whole. There are even configuration options for your taskbar too. By default an automatic shortcut to all of your Universal Applications is included (these can now run in the desktop environment thanks to Windows 10 don’t forget). The program is so lightweight and simple that it’s well worth checking out even if you’re not sure whether you want the old Windows 7-style Start menu back or not.